Adult orthodontics has become more popular especially after the introduction of cosmetic treatment options such as InvisalignⓇ. Orthodontic treatment can be performed at any age as long as the teeth and gums are healthy. There are, however, special considerations when it comes to adult braces. Adults usually have more restorations, root canals, crowns, dental implants, veneers, missing teeth and/or periodontal disease. There are also certain medical conditions and medications that can affect your orthodontic treatment. For example, bisphosphonates taken for osteoporosis can slow down tooth movement substantially. 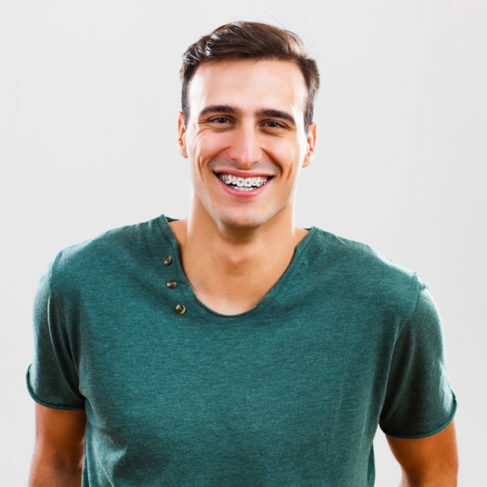 Our approach towards adult orthodontics comes from years of experiences and thousands of adult patients we have successfully treated. The key to achieving good results with you as an adult is to understand your concerns, your needs, your lifestyle & your expectations. It is also very important for us to work closely with your dentist or other specialists to ensure a team approach for a better treatment outcome. All of this and more is discussed thoroughly in your smile consultation appointment. InvisalignⓇ is an alternative to traditional braces. It makes teeth straightening convenient, safe and comfortable. Since it is almost invisible, people who are hesitant about braces prefer it. 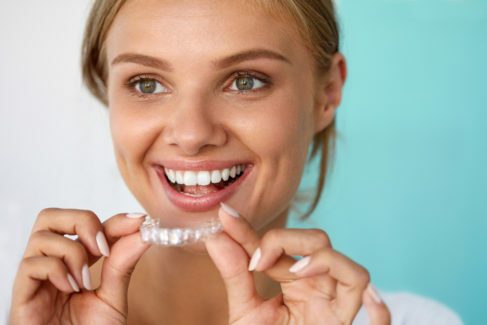 InvisalignⓇ provides custom-made aligners that gently shift your teeth in place. These aligners have no metal brackets or wires and are removable for your convenience. The first step of treatment is to perform a 3D scan of your teeth. This allows us to visualize your teeth from all angles and to design your plan using Invisalign’s advanced software. Additionally, you’ll get a chance to visualize your treatment outcome and what your teeth will look like on the computer screen during your consultation appointment. Clear braces offer the advantage of being less visible than metal braces while working the same way. They are made of ceramic, a very strong translucent (see-through) material which reflects the natural color of your teeth. Ceramic braces are great if you are looking for an option less noticeable than metal braces but you’re not a good candidate for Invisalign. 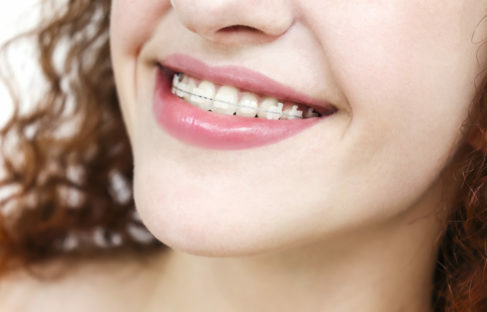 Metal braces are still a popular option even among adults. They are still the most effective and most efficient type of braces available. Luckily, with newer types of braces available, they are smaller and more comfortable than ever before. If you’re looking for a precise finish with the best possible result then metal braces would be the way to go. We also offer Damon Q2 brackets which are small, comfortable and have built-in doors to be used instead of “color ties” which can discolor easily. This makes them an excellent option for coffee-drinkers! Adult orthodontics often require a collaboration with your dentist or other dental specialists. We will gladly coordinate and work closely with your dentist to ensure best treatment results. Orthodontic treatment may be recommended by your dentist to facilitate certain dental procedures. As an example, orthodontics can be used to open a larger space for an implant placement. Another example is using Invisalign in preparation of cosmetic bonding or veneers. Those cases can be very rewarding and treatment outcomes are quite spectacular.